I found this first experience of going to the theatre in England quite challenging. 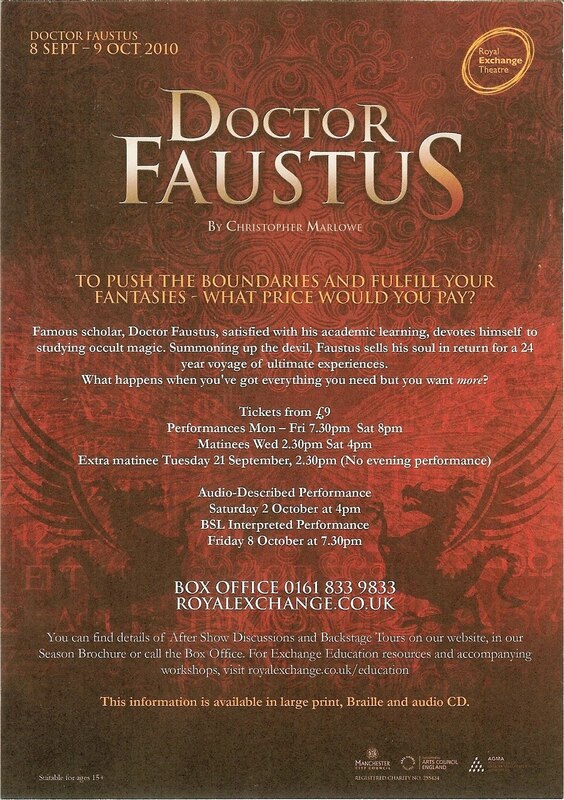 Faustus myth is one of my favourites of all times and knowing enough about it helped a great deal. 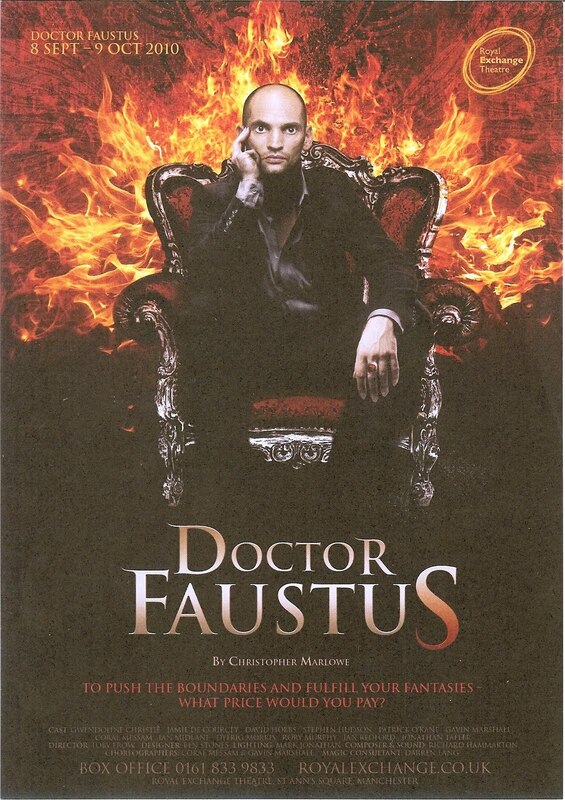 This play was based on Christopher Marlowe's. No sooner than after watching the play, while browsing some bits of the book's preface, did I find out there are different versions of his text. The reason being that Marlowe was only published once in his lifetime, and it was not even with this play. Therefore, there are several editions of Doctor Faustus. I have the book but my edition, however, is unique in the sense that includes the A-text and the B-text. 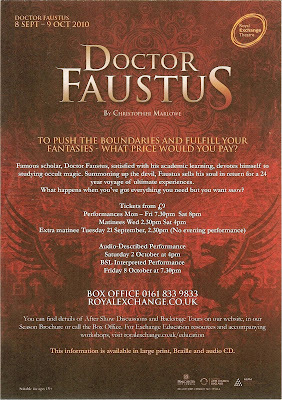 The play we saw at the Royal Exchange Theatre, in Manchester, was based on the B-text, hence the reason for not recognising some parts of the text, as I had only read the A-text. In terms of intelligibility, there were some tough parts. Although I knew the story and had read Marlowe's play recently, there are two fundamental things that made it difficult: the literary side of it (particularly when there are references to other myths, historical events, etc.) and the language side of it (Old English is not particularly my forte and there are expressions you end up missing). Yet, despite missing some bits, for the reasons herein mentioned, which become increasingly more complicated when you have to understand all of that with local accents, I took it as a challenge I partly succeeded to accomplish. What boots it then to think of God or heaven? Away with such vain fancies and despair! Despair in God, and trust in Belzebub. Wherein is fixed the love of Beelzebub. And offer lukewarm blood of new-born babes." The way the theatre is laid out as a small amphitheatre makes the audience become more involved in the play. It seats about 700 people which is quite impressive considering the size of it. The only downside is that the seats are not that comfortable (they seem a bit like bus seats). As for the Wagner character, played by actor Stephen Hudson, it was undoubtedly my favourite. Perfect accent and interpretation, at times (in the small comedic parts) reminding me of Hugh Laurie, which is always a good thing. Definitely an experience to repeat many more times.